Music industry stakeholders will convene to push our local music industry to greater heights at the Pinoy Music Summit 2014: Basta Pinoy , Push Mo Yan! on March 19, 2014 (Wednesday) at the Diosdado Macapagal Hall, Landbank Plaza Bldg. located at 1598 M.H. Del Pilar cor. Dr. J. Quintos Sts., Malate, Manila. 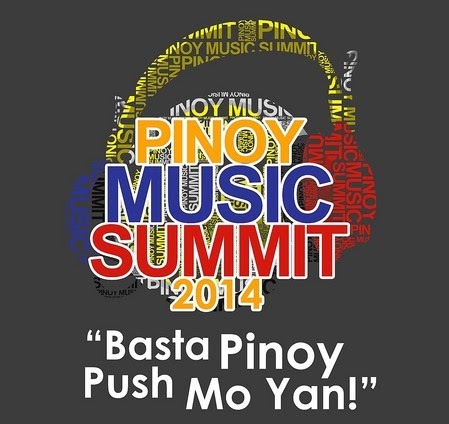 The Pinoy Music Summit 2014: Basta Pinoy , Push Mo Yan! is a conference which aims to unite various players in the music industry in making conscious commitments to the development and promotion of original Filipino music. The convenors of the Pinoy Music summit are led by the Filipino Society of Composers, Authors and Publishers, Inc.(FILSCAP), along with the Organisasyon ng Pilipinong Mang-aawit (OPM), Philippine Association of Recording Industry (PARI), Assosasyon ng Musikong Pilipino Foundation Inc. (AMP), Music Copyright Administrators of the Philippines (MCAP) and PHILPOP Foundation. The Pinoy Music Summit 2014: Basta Pinoy , Push Mo Yan! will also feature important talks on the effects of technology and legislation on the development of local music, as well as insights from the industry players of successful music models abroad. Through focused group discussions among the speakers and participants, the Pinoy Music Summit 2014: Basta Pinoy , Push Mo Yan! aims to propose recommendations and programs that will propel our local music industry towards new directions. Pinoy Music Summit 2014: Basta Pinoy , Push Mo Yan! is this year’s boldest event in the promotion of local music, uniting music makers and music lovers to keep our local music playing, loud and strong. For further inquiries, please contact Camille Miserale, Head of PMS Secretariat at (m) (63 942) 377-6275 or email: petatheatercenter@gmail.com.